A recent flurry of correspondence in mainstream consumer travel media has once again bubbled this inflight chestnut to the surface. It's a classic flying flashpoint and one that brings out all manner of human vulgarities. Is it really the height of bad manners to recline your seat without ask the passenger behind if they mind? Really? And if your request is met with a, "Well, actually, I'm quite tall and I'd prefer if you didn't", what then? Is that it? No room for compromise? Do you have to negotiate a personal-space treaty? Work out a roster system? Or is it just, London, here we come...bolt upright. And what about the passenger next to you? I quite like it when the seat beside me is slightly forward of mine so I can lean against it. Do I have the right to determine how far back my neighbour can lean? 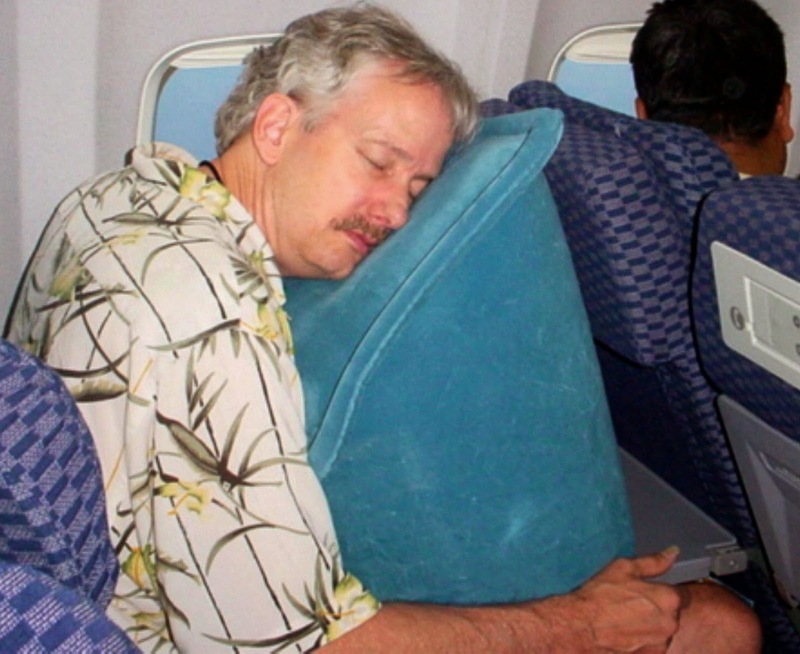 And if I bring my Skyrest Travel Pillow, do I have additional air-space rights? The fact of the matter is that every passenger has a right to recline their seat. But what I always find perplexing is why some folk go straight to maximum recline as soon as the aircraft's wheels have left the ground. Where do you go from there? As anyone who has flown a bit will know, it doesn't take long for the comforts of maximum recline to wane. Within minutes, the recline-gluttons are begging for an extra degree or two. > ONE: Keep your seat in the upright position for as long as you can bear. From take off, right through to cruising altitude, the meal service and, should you be flying longhaul, perhaps even to the conclusion of the first movie you choose to look at. So far so good. You're probably starting to feel the irresistable pull of the recline button on your armrest, but the guy behind you is happy, fed, perhaps a little inebriated and feeling like a significant part of a potentially very uncomfortable trip is already behind him. Now, here's where a bit of technique comes in. > TWO: Recline your seat in stages. Take it easy. A little at a time over, say, an hour. Not only will your comfort levels increase deliciously with every push-and-lean-gently-back, your rear neighbour won't feel like the sky's falling on his/her head. A final, gentle push will bring you to maximum recline. You're now halfway to wherever it is you're going, the cabin lights will be dimmed, a final sip of the house red, headphones piping a few tunes (try the Best of Elton John) and you're done. No issues front or back. A sense of goodwill washing over the cabin. Peace. Quiet. Until the guy behind grabs your headrest and uses it to extricate himself from the confines of 68C en-route to the loo. I can feel a touch of headrest etiquette coming on. Watch this space.